Almost two-thirds of home fire deaths in the United States result from fires in homes with no or non-working smoke alarms. When a fire occurs, smoke spreads very fast and you need smoke alarms to give you and your family time to get out of the building. Working smoke and carbon monoxide alarms are the most important devices you can have in your home because they save lives. If your family does not have a smoke alarm on every floor in your house, including the basement, then your family may have little chance of escaping a fire that could occur in your home at any time. 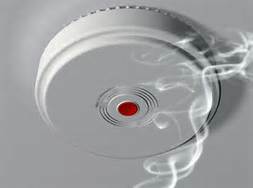 Landlords are responsible for installing smoke alarms in residential apartment buildings, so please inquire with your landlord if you do not have a working smoke detector. Install smoke alarms on every level of the home, including the basement. Interconnect all smoke alarms throughout the home, so when one sounds, they all will sound. Smoke rises, so install smoke alarms following manufacturer’s instructions high on a wall or on a ceiling. Save manufacturer’s instructions for testing and maintenance. Replace batteries in all smoke alarms at least once a year. If an alarm “chirps,” that is a warning to let you know that the battery is low and should be replaced immediately. Replace all smoke alarms, including alarms that use 10-year batteries and hard-wired alarms, when they are 10-years-old, or sooner if they do not respond properly. Smoke alarms are available at hardware stores for people who are deaf or hard of hearing. These devices use strobe lights. Vibration devices can be added to these alarms, if needed. Smoke alarms are an important part of your home and can save your family in the event of a fire. Be sure to check your smoke alarms often to ensure they are working properly.